I’ve been testing a media loan Canon EOS 500D SLR Digital Camera using the new Canon 15-85mm USM EFS image stabilised Lens (24-136mm equivalent in 35mm format) for several weeks and have grown to like it a lot. Most amateur photographers upgrading from a compact camera would find this lightweight camera and lens combination covers all their needs, taking great quality photos in the majority of situations such as family events and holidays. Serious amateur photographers may want to consider the Nikon D90 which offers twice as much battery life as the 500D and extra features such as a top of camera LCD and slightly larger imaging sensor. Note that the D90 is bigger and heavier than the 500D and costs roughly $100 more. One of the Canon 500D’s best features is how quick and easy it was to learn to use it well in manual mode. The best cameras take good quality images and get out of your way, letting you concentrate on capturing the moment. Another strength is its light weight. Using the Canon EOS 500D with 15-85mm USM EFS Lens didn’t feel any different to my old favourite Panasonic FZ30 ultrazoom camera even though the 500D body has to include bulky SLR components and the newly launched 15-85mm USM EFS lens is far superior to my old camera lens. New 500D owners upgrading from a compact camera will find its high resolution 3″ inch LCD screen (920,000 dots) with anti-reflection and anti-smudge coating really useful to compose photos using Live View or display previously taken photos. The optical viewfinder has a handy proximity detection feature to save battery life – translated to English that means when your eye gets close to the viewfinder the LCD screen is turned off to save battery power. Have a look at some of the photos I took with the Canon 500D below and you’ll see the Canon 15-85mm USM EFS Lens with image stabilisation is great as an all rounder wide to mid range lens to use for walking around street photography during the day or night photography like the Sydney New Years Eve 2009 Fireworks. The really disappointing factor about the 500D is its surprisingly low battery life. One of the key benefits SLR’s are supposed to provide is far superior better battery life compared to compact cameras. A fully charged 500D battery is officially rated to take approximately 400 photos at most. In comparison the Nikon D90 (which directly competes with the Canon 500D at a similar price point) is officially rated to take 850 photos, over twice as many as the 500D. Both cameras were tested under industry CIPA standard conditions (50% Flash Use at 23°). When I was on the roof of Sydney Harbour YHA taking long exposure New Years Eve fireworks photos I had to charge the 500D’s battery between the 9pm and midnight fireworks displays. The 500D took great photos and was easy to use but I would have lost my prime viewing position on the balcony if I didn’t have someone there to mind my tripod while I recharged the battery inside. Most amateur photographers upgrading from a compact camera would find the lightweight combination of the 500D plus 15-85mm USM EFS Lens covers all their needs, taking great quality photos in the majority of situations such as family events and holidays. 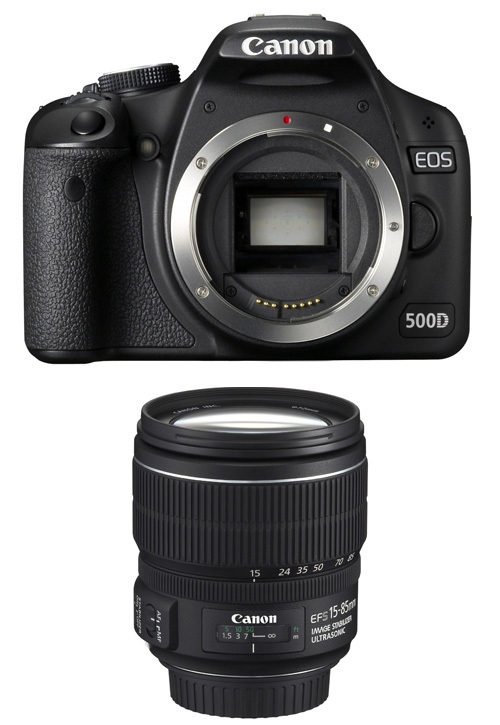 At time of writing the Canon 500D cost $1152 and the Canon 15-85mm EF-S f/3.5-5.6 IS USM Lens cost $1229. It comes with the highest resolution sensor (15.1 effective megapixels) in its class, an excellent 3.0 inch high resolution screen, extended sensitivity up to ISO 12800 and the arguably for many users most attractive new feature, a movie mode that records 1080P/20fps or 720P/30fps High Definition video footage. It combines all this with decent image quality and while its appearance might be a little plasticy and the handling can be difficult with larger hands the 500D’s main problem could be that it’s a little pricier than most of its direct competitors which, in these times of economic turmoil, might render it less attractive to some potential buyers. The US$800 Canon Digital Rebel T1i (EOS 500D) is Canon’s second best digital camera ever, right behind the US$2,700 5D Mark II, which is Canon’s best, regardless of price. What makes the T1i/500D (and 5D Mark II) so good are how far improved their ergonomics are over earlier Canon DSLRs. Now it’s easy to just shoot, where previous Canon DSLRs were always a pain in the neck, at least for me. The operation of the T1i/500D is extremely well thought out. The general purpose lens field is a crowded one, but the Canon EF-S 15-85mm f/3.5-5.6 IS USM Lens stands out from that crowd by, as I said at the beginning of this review, offering top-tier image quality over an excellent general purpose focal length range in a nicely-sized/weighted/built body with great AF and an excellent implementation of Image Stabilization at a for-what-you-get great price. This is not a cheap lens, but I think it is a great value for what you get. The Canon EF-S 15-85mm f/3.5-5.6 IS USM Lens is a great leave-on-the-camera lens – It is going to share this role with my 17-55. One problem I had was that uploading this video to YouTube took ages. I’d be interested to know the qualities & ease of use of videos on both cameras. It’s been very interesting to discover how brand-loyal many professional and amateur photographers are. Perhaps they get used to the way the settings work on their camera brand of choice. Hey, this looks like an amazing camera. I love the bubble picture. I think I will buy this before my trip to Ecuador. I loved the 500D until I got hold of my mate’s Nikon D90. I’m pretty upset to be honest as I’ve bought a few lenses for the Canon now so it’s going to be really expensive to change over. I think that’s why people become so loyal to their brands – it’s the lenses! The Nikon took me a while to adjust to the different settings and what not but all in all, I think it’s a better camera but it’s too late now! Grrr. I’ve tried the D200. Any advice? I love it, I think it’s the best at the moment. I bought mine on Amazon!!! Pretty good price! I have Canon 400D, but now i want EOS 550D!!! Nice write up and nice pictures. I have 500D (T1i) with 18-55mm kit lens. I have used friend’s Nikon D90 extensively too. Comparatively Nikon lenses produce less Chromatic Abberations but when we shoot pictures for sole purpose of publishing in websites, it is hardly seen as they are always highly shrunk. We can however post process CA if we shoot in RAW but most of the cases, I simply ignore it. D90 does not show live histogram but again we generally do not shoot in live view mode. Finally D90 has bigger sensor with crop factor 1.5x compared to 500D’s crop factor of 1.6x. In today’s technology, smaller size sensor may not be so highlighted as they are growing more and more advanced and things shrink maintaining quality – but with less crop factor you get wider zoom. For example 18mm wide zoom translates to 27mm for D90 whereas 28.8mm for 500D. As I love to shoot wider, I give +1 to Nikon.